The retention of last year’s minimum support price for paddy for the current year has added fuel to the ongoing agitation of various farmers’ organisations on this issue in this region. The paddy procurement in Punjab will commence on October 1 at the same price as that of last year. Though there is no change in the MSP, informed sources told TNS that the issue whether the states should or should not levy taxes beyond 4 per cent purchase tax was likely to be reconsidered by the Cabinet Committee on Economic Affairs shortly. 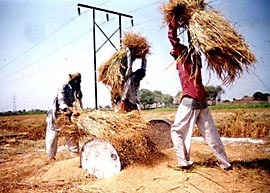 Resentment prevails among the farmers of Punjab over the low minimum support price for paddy announced by the Central Government today for 2002-2003. The gaon chalo abhiyan of the Bharatiya Janata Party which was launched here today by the party general secretary and the former Uttar Pradesh Chief Minister, Mr Rajnath Singh, did not seem to have generated the desired response as not many people attended the inaugural function here. Two cars of Mr Gurcharan Singh Pherurai, former SSP, who is wanted in disproportionate assets case and a fake currency scandal, have been spotted in Haryana even as the Jagraon police today claimed to have found at least four lockers of the family in Chandigarh, which may contain some valuable documents or valuables. Sleuths of the Vigilance Department led by Mr Baljinder Singh Grewal, Superintendent of Police, Bathinda, conducted raids at the hideouts of Balwinder Singh Bhunder, Sardulgarh MLA and confidant of former Chief Minister Parkash Singh Badal yesterday. Even as the Punjab Government is evolving a scheme for one-time settlement of violation of building bylaws within the municipal limits, owners of 22 such complexes have been served notices to vacate the buildings. Giving a severe bashing to the HelpAge India, an NGO, for launching its campaign to help the old and destitute at a five-star hotel here, Punjab Industries minister Avtar Henry today advised it to go to the slums instead of using the opportunity to gain media attention. The Central Government has made some amendments in the Consumer Protection Act, 1986, to redress the complaints more effectively. The Bill of the Act was passed by the Rajya Sabha in its recent session. The Rajya Sabha has sent the same Bill to the Lok Sabha for final approval. The Bill will be approved in the coming session of the Parliament after slight changes in some of its clauses. Weeks after former Chief Justice of the Punjab and Haryana High Court Arun B. Saharya reportedly commented upon the functioning of the Punjab Vigilance Department, Dr Rattan Singh and seven other MLAs today sought its revamping. The court of the Special Judge, Mr A.S. Kathuria, here today, supplied the copies of documents of the challan to Sucha Singh Langah, a former Punjab PWD Minister and senior Akali leader, and 15 others in a case registered against them at SAS Nagar on May 16 under sections 420, 467, 468, 471 and 120-B of the IPC and provisions of the Prevention of Corruption Act. A Vigilance team, headed by Mr Tejinder Singh Sandhu, SP, today arrested Manjinder Singh Kang, former Chairman of the Punjab Forest Corporation, on charges of amassing huge properties disproportionate to his known source of income. Residents of the city have urged the railway authorities to make arrangements so that the proposed Kisan Express between Bathinda and Delhi should depart from the city in the evening. The residents said an evening train to Delhi from the city would be more beneficial to them as compared to a morning train. In a secluded village off the Bathinda — Dabwali highway, a combine harvester rumbles across the dusty fields. The combine might not have attracted much notice except for the fact that it measured only two feet and was made out of scrap. Thousands of people, a majority of them being women, avidly listened to a religious discourse by Sudhanshu Maharaj at a special function organised by the Vishav Jagriti Mission at Shermajra village near here. As many as 85 persons have been identified and will be given loans to purchase rickshaws and rehris (hand-driven carts) under a scheme launched by the government. A big scooter chetna rally was today organised by the local Shaheed Bhagat Singh Memorial Society to mark the birth anniversary of the martyr and highlight the role played by him for social reconstruction. Around 50 women were injured, 10 of them seriously, when a bus carrying employees of Saurabh Factory situated at Malerkotla, skidded off the road and fell on one side while negotiating a turn on the Malerkotla-Nabha road near Alipur village this evening. The All-India Forward Bloc at the meeting of its Central Secretariat and the Central Committee here today condemned the stand, taken by the Mayawati government on the Ayodhya issue, and demanded her resignation. The SGPC elections, which were due to be held in October, 2001, are expected to be delayed further as the Union Government has not yet taken any decision in this connection yet. A case under the Prevention of Corruption Act was registered against a Head Constable of the Punjab police, posted in the CIA staff, here today after he was found guilty of taking bribes by implicating people in false cases. If the present situation continues and expenditure keeps on increasing many brick kilns in the area would have to be closed. This was stated by Mr Surjeet Singh, vice-president, Punjab Brick Kilns Owners Association, at a meeting held here on Wednesday evening. The meeting convened by members of the district unit of the association was called for discussing the problems being faced by brick kiln owners. A Joint Action Committee of 21 trade unions of Ranjit Sagar Dam today organised a rally in front of the office of the Chief Engineer, Ranjit Sagar Dam, in protest against the move of the Punjab Government to hand over the Shahpur Kandi extension project to a private company.